This time last week, I was still at Brathay Hall, enjoying the amazing last meal with the rest of Team 10in10 2013, celebrating the completion of the 10in10, and feeling absolutely over the moon about everything. A week later, and things are very different. I'm home again with Francis, which is lovely - being apart from him for so long was very strange - but I miss everyone in the Brathay family, hugely. I've found it very difficult to get back into the swing of things at work - I've been too tired and just not interested to be honest and could have really done with taking the week off, rather than just the Monday. I'm injured too. Diagnosed with anterior compartment syndrome and up until about three hours ago, I couldn't move my big toe at all. Luckily, it's responding well - I can now bend my big toe, although still not lift it, and my ankle/lower leg no longer resembles the elephant man's and it's much less serious than it was when I saw the physio on Thursday..."if it gets any worse over the weekend" she said, "you need to go to A&E" but it's still not fun. We went to a good friend's wedding yesterday and instead of getting up for a dance at the reception I was sat down at the side of the room watching everyone else. Hey ho. 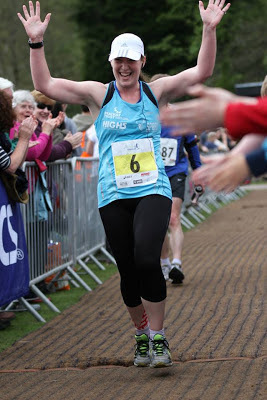 I don't know how long it's going to take to fully recover from, or to regain full movement in my ankle and toe, but I'm certainly not going to be able to run the marathon that I had booked for next weekend! In fact, I may well have a few weeks ahead of me before I can run, but I'm trying not to consider that. 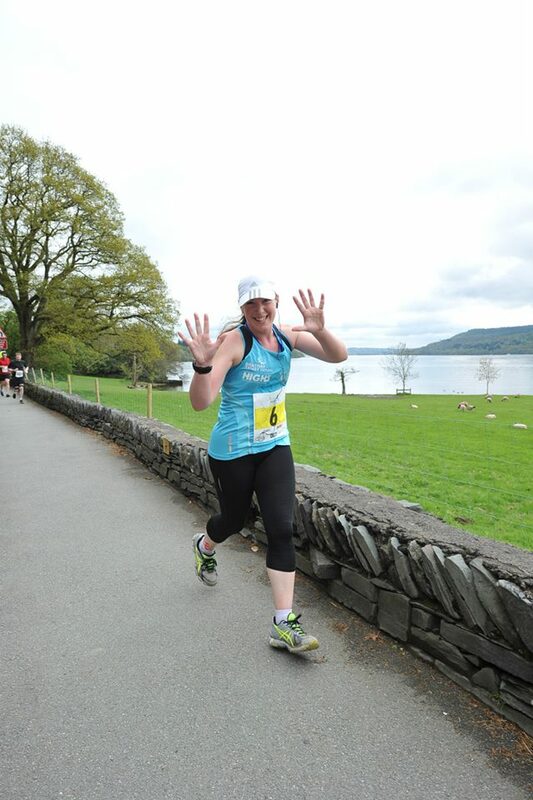 However, I am still overwhelmed at the achievement, and very proud of myself for completing the 10in10 even if I do sound a bit down about everything. Keeping in touch with everyone else on Facebook helps, as does trawling through the hundreds of photos and watching the video diaries. 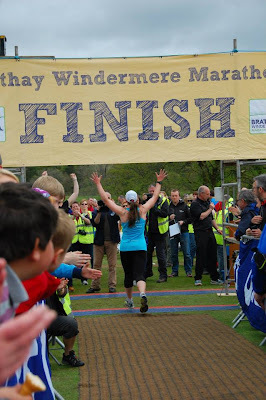 I can totally understand why so many previous 10in10ers return to Brathay and although I'll not be applying to do the 10in10 again in 2014, I do want to return next year to run the Windermere Marathon on the last day, and hope to convince Francis that we'll go up for a long weekend. I expect I will apply to do another 10in10 one day. If it wasn't for the fundraising element of the process, I'd do it again in a heartbeat, but think I'll need to leave it a few years before I ask people to put their hands in their pockets again - everyone was so generous that I don't want to take advantage of that. ***As I write this, I've seen on my Facebook feed that Mimi Anderson has just completed her DOUBLE Grand Union Canal Race...290 miles. She ran up to Birmingham non-stop, in 31hrs 50mins and then the next day, she ran back to London as part of the GUCR event in 36hrs 49mins. She is a truly amazing woman...Marvellous Mimi indeed!! My thoughts also turn to the others that I know involved in the GUCR this year who I've been trying to follow this weekend - Jerry, Ellen, Traviss, Lindley, Paul - I can't quite believe I know people who are taking part in such an amazingly challenging event. Then I start thinking of everyone else who has had races or events today. Some amazing performances out there....I'm just so inspired by everyone. 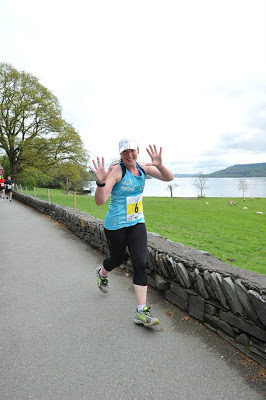 I've done the 10in10 but there's a world of ultra running out there still waiting for me. I need to stop feeling so sorry for myself, still be sensible and rest and recuperate to get over the injury, but then get back in my trainers, and get ready for my next event and stop moping about because one incredible experience is over.